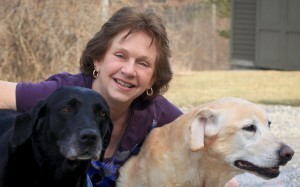 Deborah Zamperini Hewins lives in the Litchfield Hills of Connecticut, where she enjoys spending time outdoors with her dogs and cats. She grew up in the Berkshires of western Massachusetts, where she spent a lot of her childhood outdoors in the natural surroundings of the location. It is an area renowned for its beautiful scenery and outdoor adventures, so it was only fitting, that when she was required to write a children’s book as an assignment for her high school senior class, nature would play an essential role. With a blade of grass as the main character, Nobody Notices Bently inspires the reader to observe and appreciate the wonders of nature while encouraging self-confidence. Her teacher, Ms. Callaghan, liked her story enough to suggest she look into publishing. Although Deb considered it, she instead put the book aside for many years, thinking about it often. After graduating high school in 1977, Deb’s passion for nature led her to study Horticulture in college. She then married, had a daughter and a son, numerous pets, and devoted many years to her family. Through all this time, Deb often thought of her story and imagined publishing it. More than three decades after it was written, Deb recruited the innovative talents of aspiring artist Nicholas Lewis, asking him to help her story come to life. They worked on the project intermittently over the course of several years. Both Nick and Deb’s children and Deb’s pets are incorporated as characters in the story and immortalized by Nick’s vibrant illustrations. Thirty-nine years after it was originally written, Nobody Notices Bently makes its debut in print, fulfilling Deb’s life-long dream of publishing her story. Visit the author’s Facebook at facebook.com/deborah.hewins. Nicholas Lewis was born in Pittsfield, Massachusetts but spent his formative years in nearby Sheffield. He has always had an eye that has found beauty in places others may not seek it, and he enjoys being left breathless by indescribable sights. Nick gained his passion for art and illustrations while attending Mount Everett Regional High School. He honed his skills by attending Art Allstate in Worchester, Massachusetts, and the August Studio at Massachusetts College of Art in Boston, where he learned how artists are able to inspire and learn from each other. After a few years of creating art simply for himself, Nick’s passion was reinvigorated by meeting Deborah Zamperini Hewins. He jumped at the opportunity of bringing her children’s book to life, and he proudly incorporated the pets and children of both himself and Deb into the work. Nobody Notices Bently is Nicholas Lewis’ foray into the genre of children’s book illustrations. He hopes this opportunity opens more doors for him in the future in diverse areas. Nick has two sons and he currently lives in Connecticut.